Tyco Products , Spring Probes, PCB Test, Wire Wrap Tools, Telecom Tool Kit Tyco Products Ltd.
TYCO PRODUCTS is an Importer & distributor of Spring test probes, hand tools, Wire Wrapping Tools, Telecom tool Kits, Fiber Optic Tools, Anti-Static products and various other products. continued support over the years. We aim to provide a friendly, reliable and efficient service to all our customers. Same day dispatch on most stock items including wire wrapping tools, telecom tools and spring test probes. Flexibility in operation and adapting to customer needs. Our clients include Test Fixture Manufacturers (bed of Nail Fixtures) as well as Sub-Contract Electronic Manufacturers with ATE Board Design and Test facility. Most ELECTRONICS Design and Test Development engineers who build or use “Test Fixtures” are involved in PCB Test. Loaded PCBs also known as Surface Mount Devices require spring loaded contacts for an In-circuit Test prior to assembly in a finished product. We have several large companies with in-house test facilities as our satisfied customers. Other Application areas include: Military, Aerospace, Communications, Industrial and Test & Measurement. We can supply telecom tools, wire wrapping tools, spring test probes and hand tools for different industrial applications. Our Wire Wrapping Tools are widely used not only in Electronic Test & Assembly but also in the TELECOM Installation Sector. We are now widely regarded as a leading supplier of installation tools to the telecommunications industry, with a discerning customer base ranging from multi-national companies through to small installation organizations. We can supply Dynamometers, Punchdown tools, Insertion & Extraction tools, Fiber Optic Tools that are of the highest quality, offer superior performance and are made to be the most durable in the industry. We can supply cut strip and wrap Bit and Holder equivalent to the 3G bit and holder. 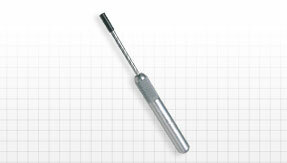 This is a high precision wrapping bit and holder which is suitable to use with a Wire Wrapping Gun of any make. Copyright2009 Tyco Products - Telecom Tools - Wire Wrapping Tools - Spring Test Probes.